“Yesterday evening Sabeel organised a special Ecumenical memorial service at St. Stephen’s Dominican church in Jerusalem for the victims of the Coptic Church of St. Peter and St. Paul in Alexandria, Egypt. It was a very meaningful service with the readings carefully chosen and the intercessions especially written for the occasion. The young woman who led us in the singing had a beautiful voice which added a special aura to the solemn event that we were gathered for. And as we lit the candles, I could not help but wonder who is going to be next. It was only last November that we also had another service organised by Sabeel in memory of the victims of the Catholic Church in Baghdad, Iraq. Not only did this message come back in a different garment, but it came back to us with the wave of colonialism and split the indigenous Christian Church. Even new born babies started to carry foreign names, making it easy to identify the faith of a person from his or her name. Despite that, we continued to remain Arabs, whether Palestinians, Syrians, Lebanese, Iraqis, Egyptians, etc. And we remain Christians, faithful to both our country and our faith. In fact some of the outstanding leaders of Arab Nationalism were Christians. I am not writing a historical document to list all those who were involved, but I am trying to reflect on who benefits from this kind of extremism that is tearing the region apart by driving a wedge between the indigenous Christians of the Middle East region and their Muslim compatriots? I remember after 1967 when the Palestinian Territories fell under the Israeli occupation, how easily the doors of the USA were opened for Palestinian emigration – mostly Christians – from the Palestinian Territories. Now all efforts with a variety of tools and strange hands are playing to split the people in each of the Middle East countries under the guise of political freedom and democracy. The basic policy of the colonial powers has always been “divide and rule”. So it is not strange that the powers that have succeeded in tearing up the whole Middle East into small states, and their allies or collaborators, are still at work fragmenting each state into political, ethnic and religious conflicts. When the masses lose hope in the absence of freedom, independence and stability, the ground becomes very fertile for extremism that could be used in different ways. Samia Khoury is an outstanding woman leader within the Palestinian community. Her voluntary work in community organisations is marked by genuine effort and huge commitment. 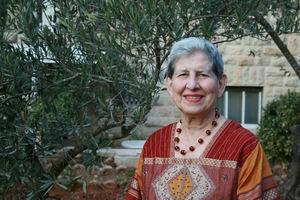 Samia Nasir Khoury retired in 2003 after serving for 17 years as president of Rawdat El-Zuhur, a coeducational elementary school for the lower income community in East Jerusalem. She continues to serve as treasurer of the board of the Sabeel Ecumenical Liberation Theology Center in East Jerusalem and on the board of trustees of Birzeit University in Palestine. Samia was deeply involved with the YWCA, including serving as the national president of the YWCA of Jordan for two terms (as the Palestinian West Bank had been annexed to Jordan in 1950). When Jordan severed its ties with the West Bank in 1988, the YWCA of Palestine was reestablished, and she was its first president from 1991-96. Her breadth of international experience has also included addressing two UN NGO Forums: in New York in 1996, and in Athens in 2000. Samia writes about justice, truth, and peace for the Palestinian people, the relationships between people and the land, the context of Christian-Jewish-Muslim relationships in the Holy Land, concerns for children in conflict, and gender issues.